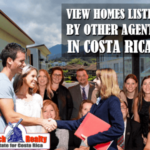 GoDutch Realty’s real estate agents all check property title before listing a Costa Rica property for sale. But, we still like to share our knowledge with buyers and sellers, so you understand better what we do for you. Many of you do not speak or read Spanish and it is not too easy to know where to get started on a website you are not (yet) familiar with. We’d love to have your real estate business and your friends’ and family. 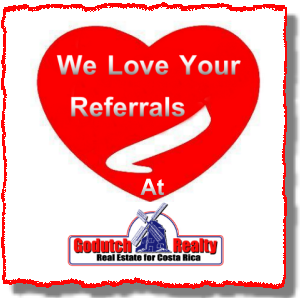 That’s why we appreciate any referrals you can send our way. 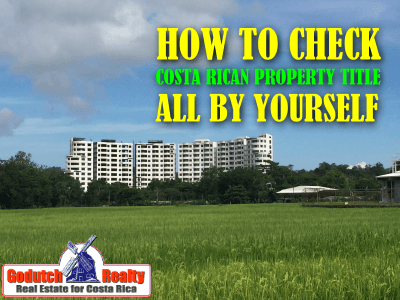 Anyone who owns property in Costa Rica should check at least once a month if his/her property is legally in good shape or not. It takes only 10 minutes of your precious time. Put it on your agenda, so you won’t forget. And of course, read this blog so you can learn how to pull a property title search online yourself. 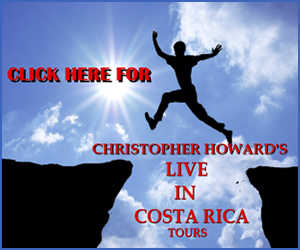 Costa Rica property can be purchased in one person’s name, jointly, or in the name of a corporation or Sociedad Anonima. 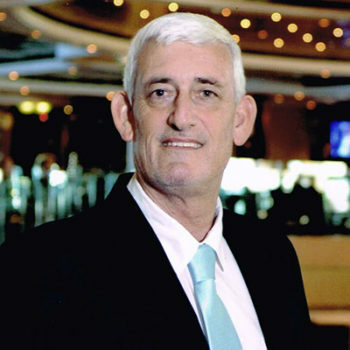 It is very common in Costa Rica for individuals to put a property in the name of a corporation, in which they own all the shares. Since 2012 you have to pay corporation tax if you own a corporation. First, you should discuss this asset protection with your tax accountant and real estate attorney. 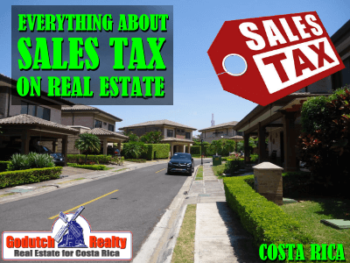 Stay informed of any tax implications (like FATCA) and other issues before you purchase Costa Rica real estate or make an investment. 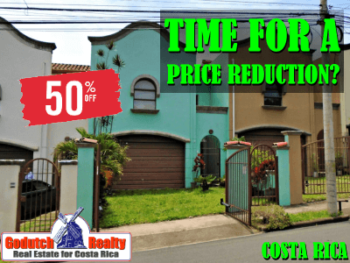 Costa Rican law requires that all documents relating to an interest and/or title to real property be registered in the property section of the National Registry (Article 460 of the Civil Code). Titled properties have a titled registration number known as the Folio Real. The property records database can be searched with this number, by name index or ID number. Properties located in the Maritime Zone function differently. 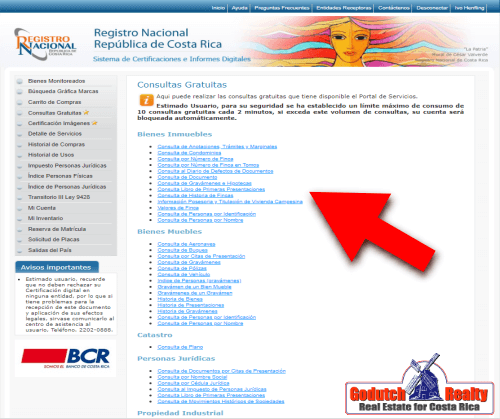 When you go to the National Registry website – Registro Nacional or Registro Público, you’ll find what is in the image below. 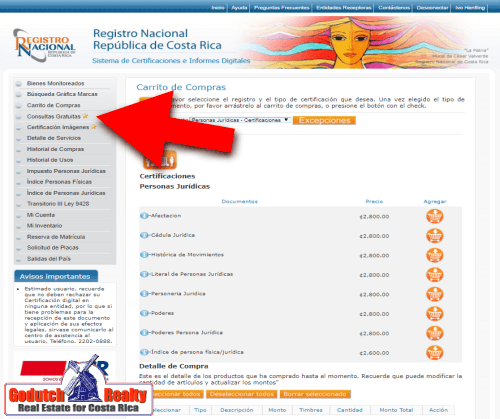 On the top left, Click on where the red arrow shows – Sistema de Certificaciones y Consultas Gratuitas (Certification System and Free Consulting). This will take you to the next screen. 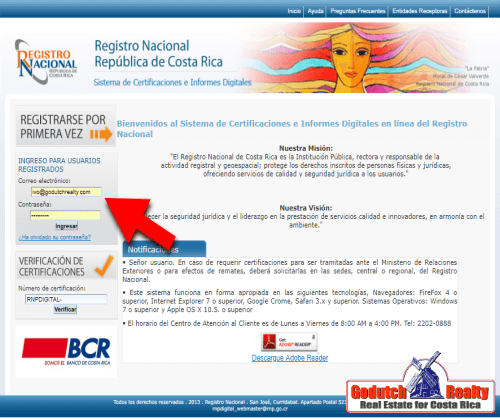 Here you need to register yourself as a user – Registrarse por Primera Vez. Unless you’ve done so before. As a result, you will receive an email where you have to validate your password. Your screen will show this text. That will take you to the next screen where you need to click on what you want to do next. The screen that will pop up is the one where you left on your last visit. In my case, it was the shopping cart. In the shopping cart, you can purchase certifications of your property search, powers of attorney of your corporations and others. But let’s leave that for another day. 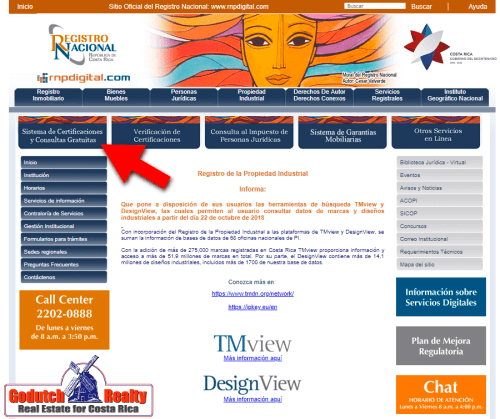 For now, we’re concentrating on doing a Free Title Search – Consultas Gratuitas (at the red arrow). Here you have several options. You might not be able to find your property by one search or by the other, that’s why you are given several options. If you do NOT find your property, it doesn’t mean it doesn’t exist, you just might be giving the system the data in a different way than the registrar gave it. Once you arrive at the screen shown below, use the scroll down menu to choose the Province where your property is located. Once you’ve chosen the Province, type in the property number (Finca) as you have it in the deed. Is your property a duplicate, you need to fill it out (very unusual). If you don’t know what that means, don’t fill it out. If your property is a condominium, you need to put “Horizontal” as F. Only the property that originated the condominium is called “Horizontal” M.
In case you have a single family property, don’t fill out anything, only the Province and the property number. Also, if you share ownership with someone else (derechos) fill out Derecho: 001 – 002 etc. And if it’s only you or your corporation, fill out nothing. 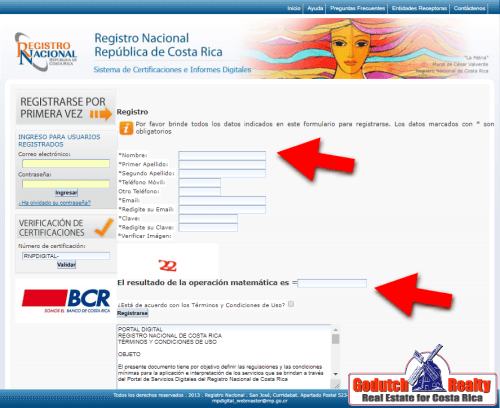 To finalize, fill out the Captcha – if the result is a negative number use minus before the number – then click “Consult”. Choose the type of ID by using the scroll down menu. There are several options. Use the option of the document that you used when you bought the property. 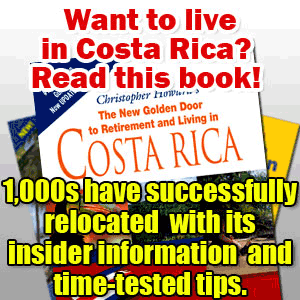 Passport numbers probably change in your home country but not in Costa Rica. Therefore you need to make sure you use the old passport number. Then fill out Captcha and hit “Consultar“. Use the scroll down menu to look for the correct ID used when you purchased the property. Have you used your passport number? I recommend you keep that passport and don’t throw it away. Find out why here. Did you purchase the property in the name of a corporation? Choose your Personal Name (Persona Física por Nombre) or the Corporate name (Persona Jurídica por Nombre) by using the scroll down menu to the correct one. Fill out names as below, name, first family name and second family name, just as you find it in the deed. If you have only one family name, try all the options using any of your first names as a first family name and your second family name as you correct family name. It is quite common that the Registrar in the National Registry committed a mistake registering your first and last name(s) wrong. In such a case, certainly, try making your property title search by ID number or Property number. If you choose the corporate option, the screen will change. Do NOT type in SA or S.A. or Sociedad Anonima, just use the name of the corporation as it is. You might have trouble with the correctness of the name because the Registrars in the Register often do not bother checking if there are any typos. Therefore I find it easier to search by cedula number or property number. In both cases, fill out Captcha and hit “Consultar“. The Property Title Report (Informe Registral) provides all the detailed information on the property. 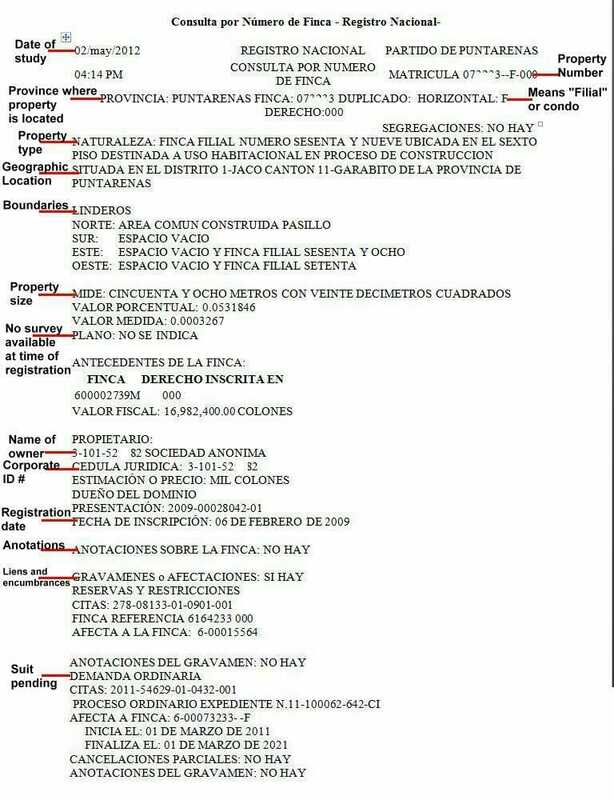 Therefore, below, I’ll show you as an example my condo in Sonesta One Jaco and detail on the image what each part of the report means. and other recorded instruments that would affect title. 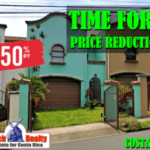 Since Costa Rica follows the doctrine of first in time, first in right, recorded instruments regarding land for sale presented to the National Registry are given priority according to the date and time in which they are recorded. 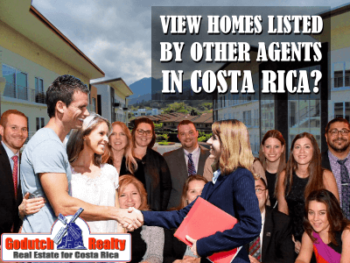 For purpose of the transfer of Costa Rica real estate, this means that any mortgages or liens which are not recorded at the time that title is transferred are invalid. Since the certificate of title issued by the National Registry is prima facie evidence of the condition of title on the date issued, any instrument not recorded at the time the certificate is issued is invalid. In the opinion of all real estate lawyers I have done business with, this eliminates the need for Title Insurance since any instrument omitted from the report is deemed invalid. In this case, this condo in Jaco has a suit pending or lis pendens. The term “lis pendens” is Latin for “suit pending.” A lis pendens is filed against a real property to indicate that the property title is questioned. Or that some sort of lawsuit involving the property could occur in the near future. This also serves as a public notification that the property is involved in a lawsuit when someone files such a notice. Obviously, every situation is different. In some cases, a review of the National Registry record will not be enough to uncover all encumbrances. That is why it is important that buyers do not use the seller’s attorney but have their own attorney. Their attorney can conduct an independent property title search and investigation rather than rely on the seller’s attorney. A good and responsible closing attorney will pull a title search on the day of the real estate closing. 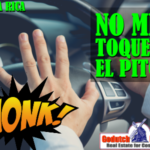 Also, every GoDutch Realty agent is ahead of the game and will pull the title search when he/she lists the property. 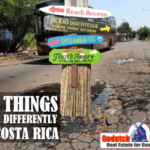 Contact a GoDutch Realty agent for your Costa Rica real estate needs right now. 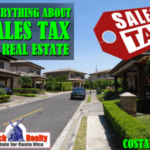 How much are sales commission and other fees to list a property?